Mobile apps are one of the most common products created by startups today. Many startups come up with an app idea that will require a big budget to develop. Over the past few years or so, apps have become a big deal and many people are looking for help with their app idea. Often, they are shocked to learn how expensive it can be to get their full app developed. No matter how big and elaborate an app idea is, and how complicated it will eventually become, I always propose to build an MVP (Minimum Viable Product) for under $20K. 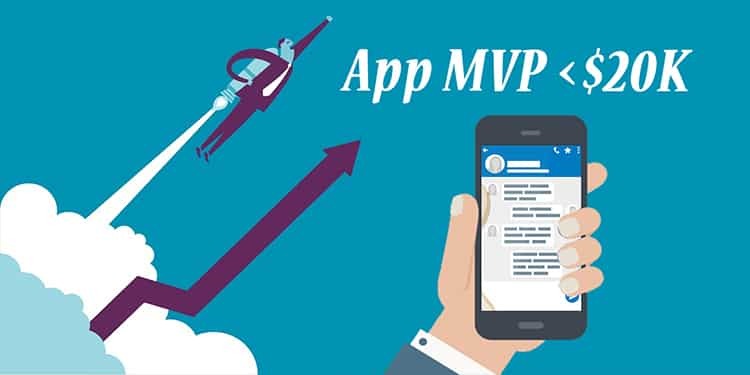 Basically, an MVP is a “light” version of your app that can be developed quickly and inexpensively. There are lots of great reasons to go with an MVP first, not the least of which is that you will probably be able to self-finance the development — a definite perk for most startup entrepreneurs. You then test the market for your app without involving tremendous debt or angel investors. Think of some of the most wildly successful startups–Instagram, Uber–and chances are they began as MVPs. Bear in mind, the ability to develop an MVP app for less than $20k is the result of lots of experience and understanding of the app development process and tweaking it at several steps! We achieve it with some thoughtful, deliberate choices. Developing An MVP For Less Than $20k? You want to write a detailed feature list for your app. Don’t worry about how technical it sounds. That’s not the point. All you need is a basic list of features that you’ll be able to trim to keep your budget under $20k. Write your list from a user perspective and product owner perspective. User should be able to signup with email ID and password. User will receive a push notification for all the users. User will see a home screen with following option. User will be able to see a list of news with a description, image, and tile on the home screen. User will have an option to filter out all the screens. Once you have your list ready, you can reach out to app developers to get an estimate on the cost. If they all estimate below your $20K budget, then go with all the features. If the ratings are higher than your budget, then you’ll need to cut down the features list. You can drop down the features and functions that are not a high priority or are redundant. For example, if you want users to be able to login with email, Facebook and Twitter, you don’t have to have all three methods to login in the MVP, it will increase your cost. In MVP, you may want to have just the login by email, or login by facebook. Select the one method you think is the best.